We all love Dr. Oz. Despite his authoritative demeanor and hypnotic spiels regarding all things health, I encourage everyone who reads new information about health care trends to read new information about health care trends. Indeed, cancer is on the decline in America due to preventive screening compliance amongst women (and men); however, thyroid cancer is on the rise. Why? Therein lies the controversy. According to the two links above, failure to use thyroid guards during mammograms and during dental visits is a contributor as well as estrogen levels. Whenever we see the big “C” in writing or hear it discussed on T.V., ears perk, eyes widen, and depending on the report: panic ensues. Indeed cancer kills and if we left it to our fast-paced and varied media culture, everything from standing in front of microwaves to holding a cereal box with the bar code close to your skin causes cancer. In addition, it seems that breast cancer and the need to promote that “pimped pink ribbon” has almost elevated the disease to a level of vogue. 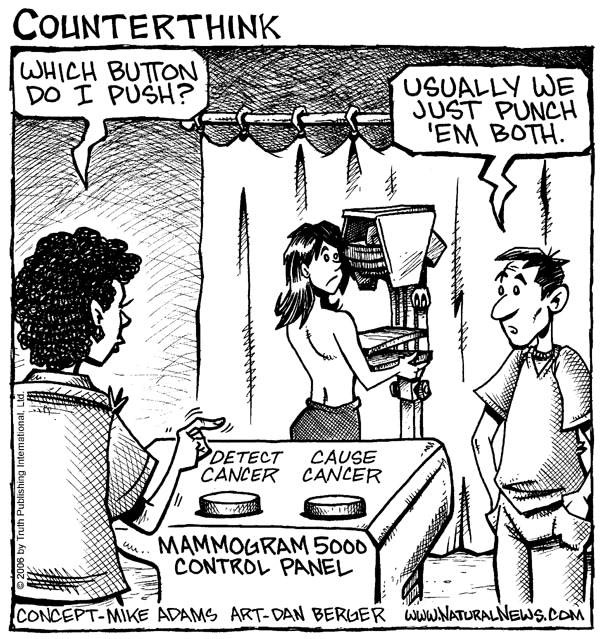 If you don’t have breast cancer or you’re not a survivor, you’re just not cool. Conversely, blueberries, dark chocolate, asparagus, almonds, and kim chee are urban legend favorites for halting atypical cell growth or preventing cancer. Who on earth are we to believe? My educated, remission-conditioned-self advises you to seek medical attention you trust, cross-reference all that you view and read, and lead a heart-healthy lifestyle that includes a high-fiber diet, exercise, personal enrichment, and spiritual balance. If the latter isn’t your cup of tea and you’d prefer to indulge in greasy, rich foods, make love to your couch all day with the remote in tow, and embrace anxiety versus peace, then you’re probably going to be a bulls-eye target for cancer and her diseased cousins: cholesterol, high blood pressure, and diabetes. The choice is yours. Read new information and then read new information. Educate yourself. We all love Dr. Oz – and the Emerald City too – but kicking cancer requires more than a Dorothy three-heel click. Just kidding, but not really. BUT, what an interesting article! I mean, using the “thyroid shield” could cause one to have to take multiple breast x-rays which will in turn cause more radiation exposure which is definitely best at its absolute minimum… Whew! Thank you for sharing this very important information, Penny! Or should I say, “Short Story – MAXINE – Award-winning” Joey P? Congrats again. “Award-winning Dr. Joey P?” Both have a nice ring! subject. Fine along with your permission allow me to take hold of your feed to keep updated with imminent post. It’s always interesting to read content from other writers and use a little something from other web sites. It’s so hard to know what information is accurate, and we’re often getting contradictory information. I like that you don’t tell the reader what point of view to believe, just to read, read, read! BTW, the links in this article are now broken.